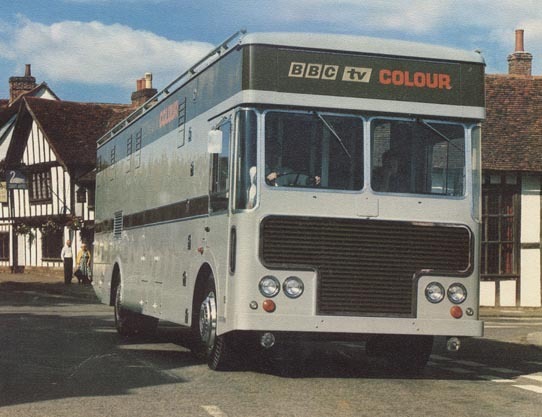 CMCR9 (C9) was one of the fleet of 9 Type 2 colour mobile units designed by the BBC and Pye TVT, fitted out at Pye's Royston factory. 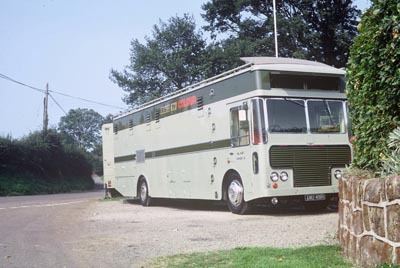 The vehicles were Albion 'Clydesdale' CD21XLW chassis (extra long wheelbase) fitted with Leyland 400 6-cylinder diesel engines. The coachbuilt bodies were made by Bonallack, who specialised in aluminium construction. 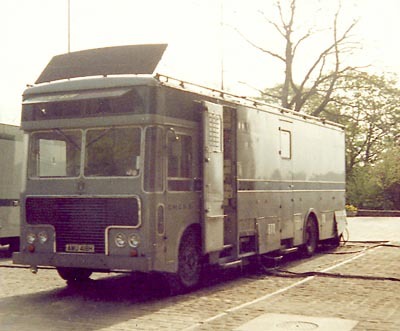 The BBC vehicle identifications were CMCRs 4 to 12, (1-3 being Type 1s) and C9 was one of three (C7-9) fitted with Pye PC80 cameras- the remainder had EMI 2001s. For some reason C9 was the only one in the London fleet with these cameras. It was based at Kendal Avenue OB base and was designated Unit 5. (London based scanners were prefixed LO, so it was LO5.) It was the only London unit with Pye cameras. Thanks to recent information provided by two members of the crew who worked on it when it was new, we now know that C9 (LO5) was the scanner used for the live climbing of South Stack (Anglesey) by Joe Brown, Hamish MacInnes and others, in August 1970. 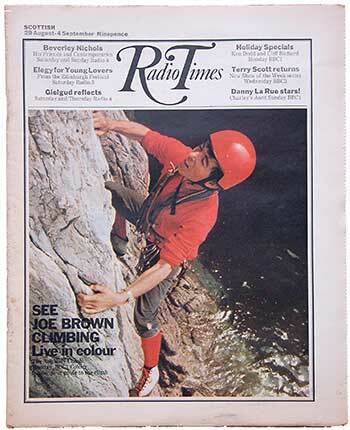 This was the first colour live climbing programme, following on from the success of earlier programmes such as the ascent of the Old Man of Hoy in the 60s. 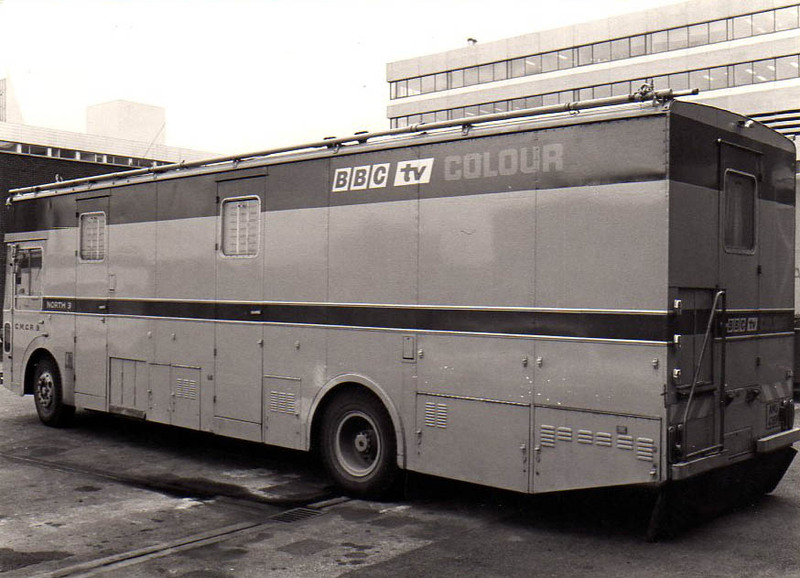 It was a triumph of technical ability by the BBC, a world first. 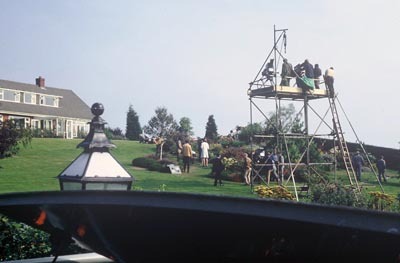 In the picture below, taken by one of the crew, you can see the back of the scanner with the steps up to the sound area. 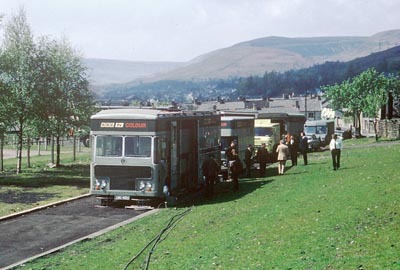 Two BBC Land Rovers, a Bedford CA van and several other vehicles can also be seen. The two Bedford artics would have brought the camera cables, over 50 drums, each weighing a couple of hundredweight but holding only 100 feet. 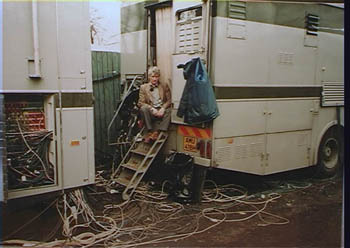 The reason LO5 was used was that the Pye PC80 cameras could be run on up to 5,000 feet of cable, using specially built equalised amplifiers. No other cameras could operate on that length, essential to get from the only accessible point to the camera positions needed to get shots of the rock face. I believe that the weather turned bad and there was endless trouble with water getting into the joints. Despite raiding most of the camera cables from every OB base, there was only enough for two cameras to run the full distance. We are hoping for more information on this event. A second climb using LO5 was donein May of the following year, of Aonach Dubh, Glencoe. 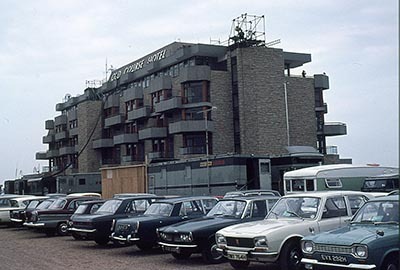 C9's first OB, following tests at Brookmans Park, The BBC sailing Club at Teddington and a 'not for TX' football match at Fulham, was 'Match of the Day' from Tottenham onthe 30th January 1970. In the same year, other notable OBs were: The Boat Race, Royal Ascot, the Open Golf from St. Andrews, the Commonwealth Games from Edinburgh, and the Royal variety Performance from the London Palladium. 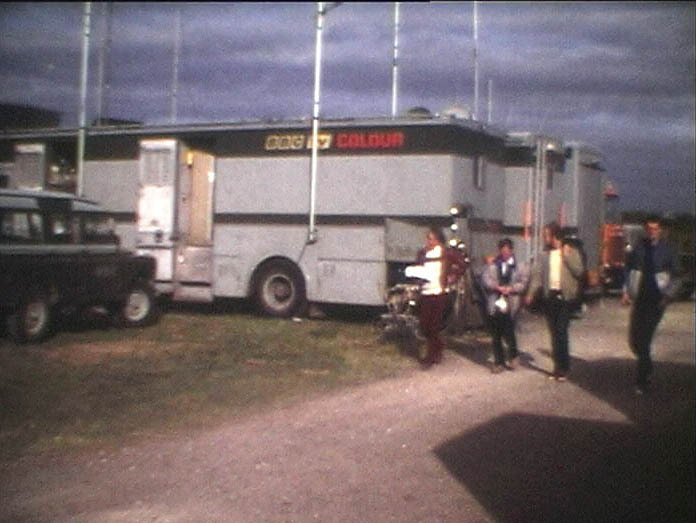 One of the two scanners visible here is C9, at the 1970 Golf Open. Pictures from the Pye factory of CMCR9 under construction! Around 1972 it was swapped with Birmingham for an EMI equipped scanner, CMCR6, which became LO5. This meant the London fleet was now all EMI. The picture below shows her on the road, leaving Epsom after covering the Derby Day. The front number plate has moved to the bumper, and is now a reflective type- it is still in that position, but another later shot (see below) shows the plate on the grille. The fog lamps have also moved. However, we now believe the heavy steel bumper was added at Manchester. 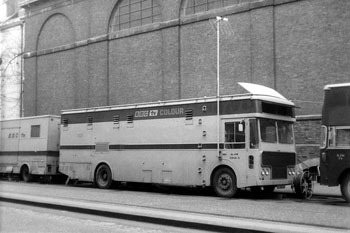 During her time at Birmingham C9 was called CM1 (Colour Midlands 1), and of course covered many events all over the Midlands and occasionally elsewhere. She has also acquired a logo on the front, on the water filler flap under the windscreen pillar. It can be seen in some photos, but not well enough to make it out. It was believed to be the BBC coat of arms. 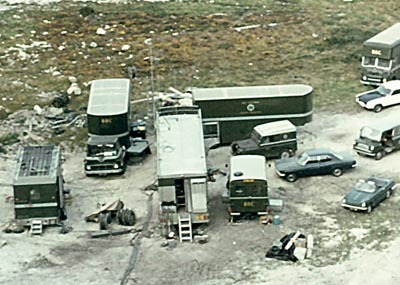 In April 1980 C9 was moved from Birmingham to Manchester to join CMCRs 7and 8, the other Pye equipped vehicles. It then became known as North 3. 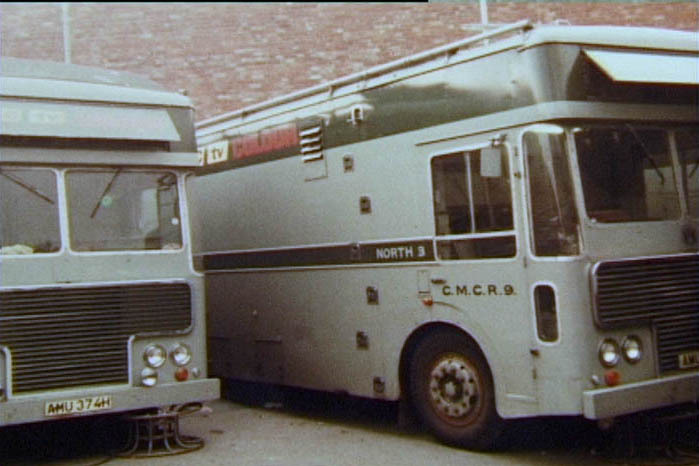 The first OB as N3 was a football match from Manchester City FC. Apparently it was in better condition than the others, having been looked after more carefully (or used less, depending on your viewpoint!) It was considered past its sell-by date by the Birmingham crew, and it reached Manchester with the production control room decked with fake cobweb spray. It was dubbed 'The Phoenix', having been given a second lease of life. This is now the second 'Flight of the Phoenix'! On the road around 1975, leaving Epsom. We did not have much information about C9's life at Birmingham, but thanks to several former Pebble Mill staff we have filled in some of the gaps and now have some brilliant new pictures (Aug 2012) of C9 (then CM1) in action in the early 70s We have seen a few excerpts from programmes as well, including 'Come Dancing' introduced by Terry Wogan, and an early OB drama about Birmingham's immigrant communities. One regular programme was 'Gardeners' World', with Percy Thrower, done from his garden 'The Magnolias' near Shrewsbury. Outside The Magnolias on 'Gardener's World'. Note- early style number plate below bumper, chrome wheel trims, and no crest yet on the radiator filler cover. 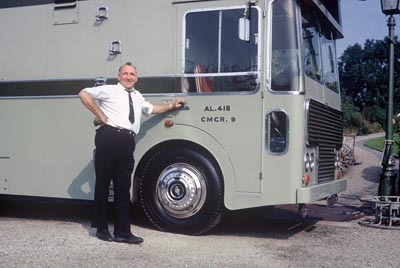 Rigger /Driver Ron Lane poses with CMCR9, showing the impeccable state of the bodywork under his care. Taken at the same time as the other photographs. We used this picture as a reference for the signwriter to recreate the door lettering. Taken from the roof of CMCR9 in the same position. The lamp can be seen in both pictures. The camera scaffold carries 2 of the PC80s, two others can be seen at ground level. On 'Match of the Day' in South Wales- anyone recognise the location? The BBC crest has appeared on the front by this time, again early 70s. 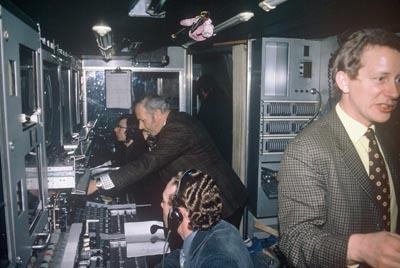 Inside the VCR during an OB- possibly at Silverstone. 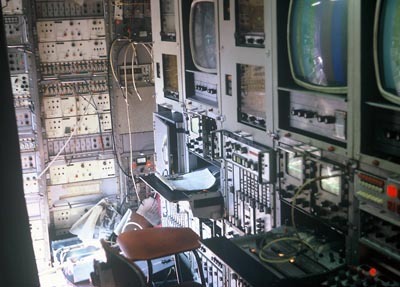 Note the early Pye colour monitors (rare view without the trays hanging out) and Camera 5 rack in use. There are differences in the units in bay 5 (right hand in background) from how things are now. The subcarrier frequency monitor can be seen (now in bay 3) and blanking panels where the ARBEG unit is now. The vision crew at work. The lighting console is still in place- we think this was removed before C9 went to Manchester. 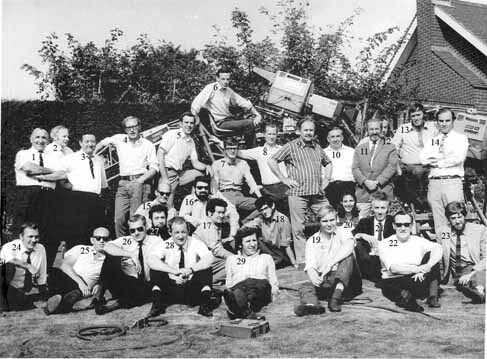 The photograph below was taken at 'The Magnolias' after a 'Gardener's World' ( the last from there, as it was moved to Clack's Farm) showing the crew and the Pye cameras. It was kindly donated by a former member of the crew, and we have managed to identify many of those shown. We have a clip from an Open University programme on Politics and the Media, which includes film footage taken inside a Type 2 scanner at the Labour Party Conference in 1976. We now think that this was C9 during the Midlands period, as several of the crew have been identified as being from Birmingham. 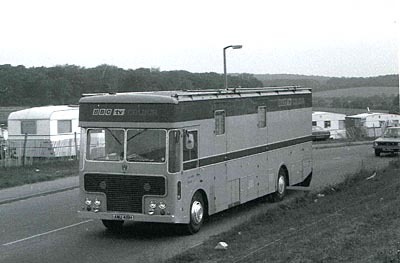 C9 as North 3, thought to be somewhere near Leeds c.1980. North 1 (C7) and North 3 (c9) at Oxford Road, and at Troon in 1982. her last OB? Maybe not! We have found some more information which suggests that C9 was at another OB, the 'Grand Slam 1982' from Painswick House in Gloucestershire. This was in September 1982. The OB was crewed from London, but we have found 3 copies of a schedule in a cupboard in C9, and it possibly ties in with another record, but it does not say which scanner(s) were used. 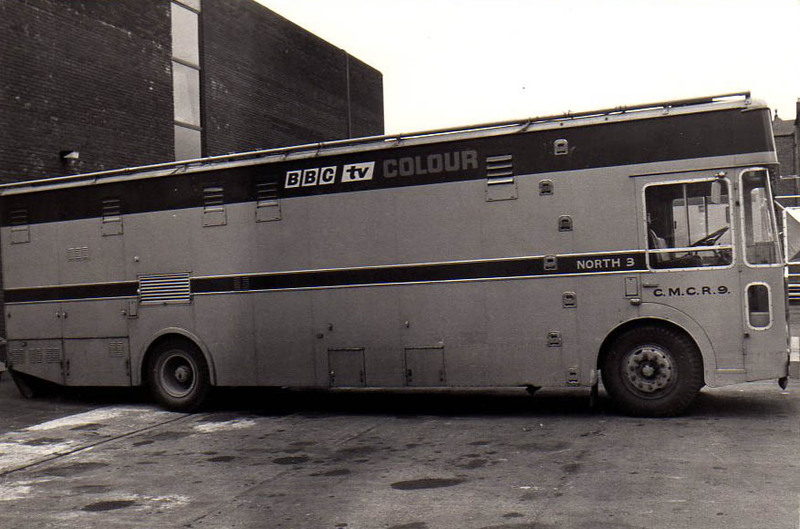 Any ex BBC staff out there- do you remember this OB and if CMCR9 (N3) was involved? 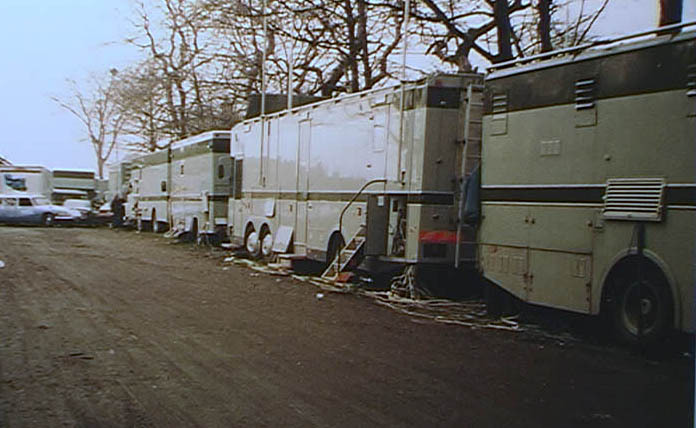 C9 at Aintree for the Grand national in 1982. Note the 'new' Type 5 behind. Also visible are an MVTR and the Safari camera car. We have records showing many of the OBs that involved C9 between 1980 and 1982. A list of these will be compiled and put on this site soon.